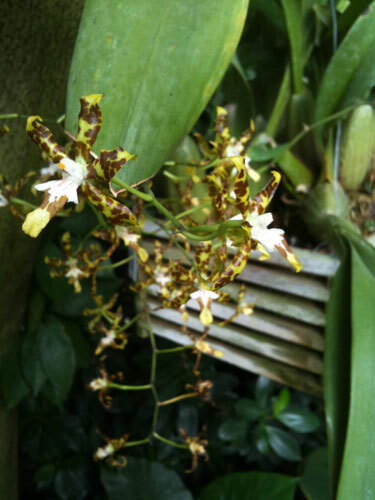 The Oncidium orchid is one of my favorite types! Many produce long, brached sprays of hundreds of flowers. Many are yellow orchids, others are primarily white orchids, and some come in other colors too. Oncidiums like a intermediate-to-high lighting. It varies a bit with the particular type of oncidium. If the leaves are dark green, give it more light. If they're reddish, give it a bit less light. Provide cool-to-intermediate temperatures. 60-75°F is a good daytime temperature, and they appreciate a 10-15°F drop at night (6-8C). If nighttime temperatures are too warm, this may prevent blooming. Like most orchids, Oncidiums prefer humidity of about 70%. If you're growing orchids indoors on a windowsill, you may need to set up humidity trays for them; place some gravel in a tray, fill the tray with water to below the level of the gravel, and set the plant on top. Oncidiums don't like to dry out. Water these orchids as they approach dryness. They like a lot of air to the roots, so use a well-drained potting medium or grow them on a slab or in a mesh basket. Coarse bark or osmunda fiber are good potting media. Many Oncidiums prefer a dry rest after flowering; if the leaves drop, you have one of these: provide only enough water to prevent the pseudobulbs from shriveling until it starts actively growing again. The most important advice for growing these orchids is to provide cool enough nighttime temperatures, lots of air to the roots, and not let them dry out except during a rest period after flowering. Do this and they'll thrive.